It hasn’t been a bit warmer over in Boyne City than it has here, but they are an intrepid bunch. Where there is intrepidity, there is Babs. She brought you back a present: the ice fountain from the Boyne City Park. Yes, the skating rink beyond is Lake Charlevoix. Yes, it is frozen, but not in a reliable manner, so stay off it. I’m sorry. Do I sound grumpy? I do. I am. Here’s a cheerful thought. The ice fountain has created an interesting sculpture. I think it looks a little bit like Mount Rushmore. Sort of. Except the face is of Old Man Winter himself. With all the crankiness up there, this could be Old Woman Winter, too! Hang in there!!! You will enjoy watching this iceberg floating in Lake Charlevoix, probably until sometime in July. Here in Connecticut it was darned near 50 degrees this weekend — a slice of heaven. It’s coming! GACK! The unkindest cut of all! We are supposed to have warmer weather this week too. With all the snow and ice we have to melt, I hope for a gradual, but very steady, warming. Sigh. Well, you have my sympathy. I also am feeling a coward, now, lingering as I am before heading off to the docks because it’s “only” 55F. If the sun would come out, and the wind die, it would be more than bearable. As it is, I believe another cup of coffee’s in order before I head out. Full disclosure: Babs goes out and about making images and then comes back to the Art Cave on Torch Lake where she subjects the images to review, selection and editing. Thus images are not posted on the day made. This one was made on March 30. On the other hand, there are still snowpiles out there, and ice. Lots and lots of mushy ice. It’s funny how sunshine makes almost anything more bearable. It is a restorative elixir. I hope you get some today, with no windblown Stuff landing in fresh varnish. Keep thawing that sense of humor. It, too, is a work of art! It is what keeps us Old Women going. There ya go. See, you’re warming up already! (P.S. us Old Men, too!). This whole interchange makes me think of Richard Guindon, a wonderful cartoonist in the Detroit Free Press. He created a whole world of Indeterminate Age people bundled in winter clothes and befuddled by Winter. They always cheered me up. They are my people. Here is a gallery of examples. Your people are very funny. I especially like the second one, top row, about cabin fever. Those are not happy Hayo-Went-Ha’rs. Thanks for posting! She does. I have no idea what we’d do without her Around Here. I think there should be an official proclamation requiring winter to end everywhere by the end of March…with no more snow, ice or cold. For anyone anywhere in Michigan. I should work on that. Ah well, we all feel cranky, and that is part of the problem. Put enough cranky people in a room and things can get ugly fast. Look at Congress. But it is also good to be understood. I have sunshine and hot water. Love the fountain, Gerry. Am happy to report that my RHUBARB and DAFFODILS have broken through to the sun this morning! There! Isn’t that a cheery thought? Yes! Rhubarb pie, rhubarb crumble, rhubarb sauce . . . I love rhubarb. And there is sunshine out there, and I have hot water. Oh my, life is good. Predicted to be 92 Thursday and 91 on Saturday,. Already. And it’s barely April. My electricity bills are going to be higher than giraffes’ ears. So on average we’re perfectly comfortable then! And somehow we both end up with heavy expenditures. Ah well. Wow! What a beautiful scene. Why thank you. 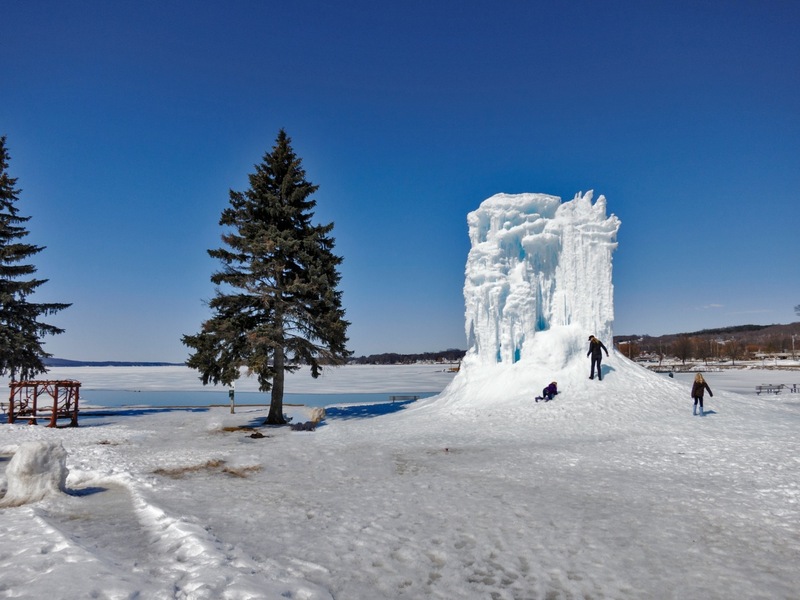 Boyne City does have a lovely waterfront park in all seasons. OK, I suppose it’s an icefront park right now.